Finally awarded dolphins and pronounced qualified in submarines by Commander Tim Halliday, the second captain of Hammerhead I served under. 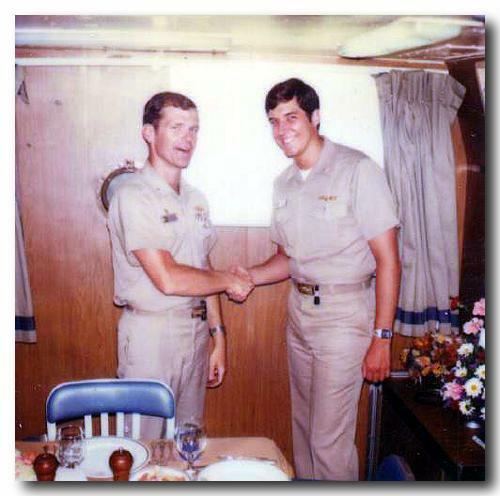 Shot is taken in the wardroom in mid-1984, at sea in the Mediterranean. By then I had moved on to become the electrical officer, and then the main propulsion assistant, machinery division officer, assistant engineer and ship's diver. These were the Reagan years of the Cold War, and Uncle Ron (beloved by the Silent Service) wanted to give the Evil Empire one scare after another. One Sunday, Hammerhead was in port, the reactor cold, the plant in cold wet layup, my engineroom torn apart for a badly needed 'upkeep' by the tender personnel, when Exercise Flea Flicker kicked in. Flea Flicker was a classified operation designed to terrify the Soviets. The idea was that a Cosmos surveillance satellite would come overhead, and as soon as it went out of sight over the horizon, the submarine force would be scrambled to sea, so that on the next pass over the U.S. east coast, the submarine piers would be missing some 65 attack submarines. The exercise was so secret - since the Russians eavesdropped on communications, filled Norfolk with prostitutes and spies - that no one below the rank of Vice Admiral knew when it would happen. Warnings had been issued months before about the coming Exercise Flea Flicker. But onboard, we took those about as seriously as warnings of the end of the earth - repent! Flea Flicker is coming. And we payed it no mind. It was forgotten. So when the phone rang at my roommate's condo that Sunday night as were headed out the door to dinner, we looked at each other. In one of those rare psychic episodes, the communications officer said, 'that's bad news.' He picked up the phone and looked astonished, putting the phone back. 'The boat's going to sea. Now. We gotta pack.' I said, 'no, it's not. My engineroom is completely dismantled. Hamsterhead ain't goin' nowhere.' 'Oh, yeah,' he said. 'The captain wants to see you in his stateroom about that.' A half hour later we'd threaded our way through empty Norfolk interstates and arrived onboard. Every other submarine at the base was shoving off or already in the channel. Hammerhead stood alone. I went into the engineroom, and for the next 20 hours put it back together while we started the reactor. Hammerhead barely made the deadline to get to sea and pull the plug. Submerged in the Atlantic, we all stared at each other, wondering if this were it, the big one, World War III, the balloon going up - because, how better to do this than calling it an 'exercise?' As soon as we were down, Cosmos made its next surveillance pass and found…not a single nuclear submarine. They were gone. All gone. Rumor had it that the lights burned at the Kremlin for three straight nights as the bosses of the Evil Empire wondered what was coming.